A counterbalance valve opens a free flow in one direction while regulating the opposite flow until a certain pressure is reached. Counterbalance valve typically installed in line between directional control valve and a vertically mounted hydraulic cylinder actuator. Counterbalance valve act as a hydraulic restrictor to hydraulic cylinder. For example, a counterbalance valve is used in a hydraulic crane boom section. The valve will act as a resistance to the hydraulic flow when the boom is lowered and support the boom in the up position. The valve element is balance-spool valve 4 that consists of two pistons which are permanently fixed on either end of the shaft. The inner piston areas are equal; therefore, pressure acts equally on both areas regardless of the position of the valve, and has no effect on the movement of the valve, hence, the term balanced. A small pilot piston is attached to the bottom of the spool valve. When the valve is in the closed position, the top piston of the spool valve blocks discharge port 8. If fluid from the actuating unit enters inlet port 5, it cannot flow through the valve because discharge port 8 is blocked. However, fluid will flow through the pilot passage 6 to the small pilot piston. 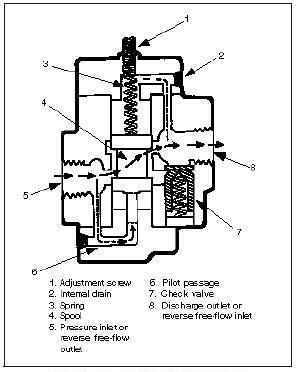 As the pressure increases, it acts on the pilot piston until it overcomes the preset pressure of spring 3. This forces the spool up and allows the fluid to flow around the shaft of the spool valve and out the discharge port 8. During reverse flow, the fluid enters port 8. Spring 3 forces spool valve 4 to the closed position. The fluid pressure overcomes the spring tension of check valve 7. It opens and allows free flow around the shaft of the spool valve and out port 5. The operating pressure of the valve can be adjusted by turning adjustment screw 1, which increases or decreases the tension of the spring. This adjustment depends on the weight that the valve must support. Small amounts of fluid will leak around the top piston of the spool valve and into the area around spring 3. An accumulation would cause a hydraulic lock on the top of the spool valve (since a liquid cannot be compressed). Drain 2 provides a passage for this fluid to flow to port 8.